When searching for statistics it is sometimes difficult to find all of the statistics for any particular year. Not all of these estimated figures are from the same source or the same year but the information provided will give us a general idea of the severity of the situation. 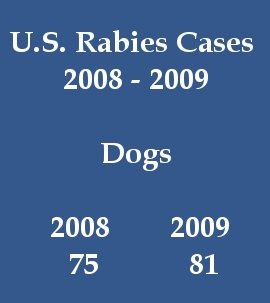 Many state health departments post their rabies statistics online. 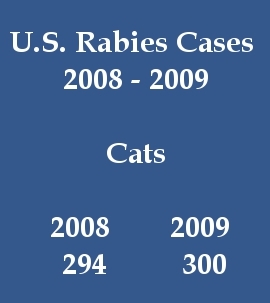 If you are interested in reviewing your state's statistics google "your state rabies statistics" or "your state epidemiology records"
Any animal bitten or scratched by either a wild, carnivorous mammal or a bat that is not available for testing should be regarded as having been exposed to rabies. Unvaccinated dogs, cats, and ferrets exposed to a rabid animal should be euthanized immediately. If the owner is unwilling to have this done, the animal should be placed in strict isolation for 6 months and vaccinated 1 month before being released.